2009 began at Matjana Preschool on February 3rd. 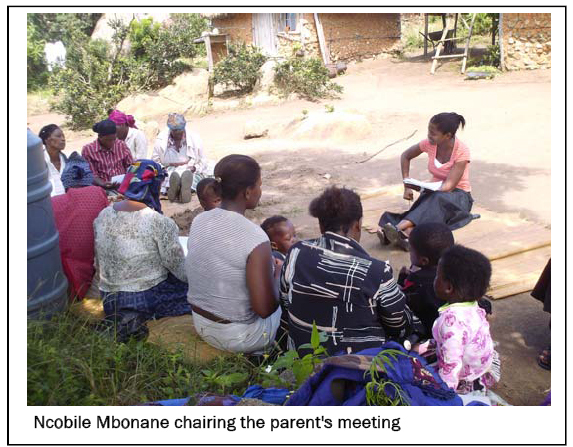 Parents, children, teachers and school committee members gathered at the school, to finalise the student enrolments, before holding a meeting. At this meeting, many decisions were made and a new school committee was elected. 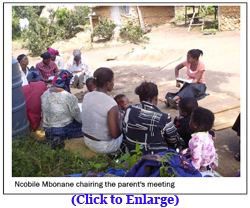 It was also an opportunity for the parents to discuss the school’s policies and some of the exciting changes taking place at the school in 2009. There are many new or improved things going on at the school this year, even a new teacher, bringing the total number of teachers to three. Both children and teachers alike are very pleased to welcome Lisa Marino, from Canada, to teach at the school. The kids are mostly excited because she’s Caucasian (which equates to quite exotic and interesting features for five year olds in Kaphunga! ), but also because she’s got a super-duper camera they can pose for. The teachers are just happy to have some extra hands on deck to help with the kids. Lisa will teach in the school on a voluntary basis until April and will also coordinate a photography project with students from the local high school during her stay. Ncobile and Fortunate will both be teaching at the school again this year, however they’ve both also been elected to new positions on the school committee. Ncobile, who has been the committee Secretary for the past two years, was this year elected the committee’s Chairperson. Fortunate, who was not involved in last year’s committee, will play the role of Secretary this year. Michelle will continue to be the school’s treasurer and parents, both new and old were also elected to the committee. The parent’s made a few decisions at the first meeting of the year. They decided to give both Ncobile and Fortunate an increase in their living allowance (a decision that was accompanied by a big clap and a few cheers from the parents and grandparents). The pay rise was in recognition of their huge teaching efforts, and made possible by the school’s improved financial situation (for the first time ever we have begun the school year with money in the bank, which is certainly a nice feeling). 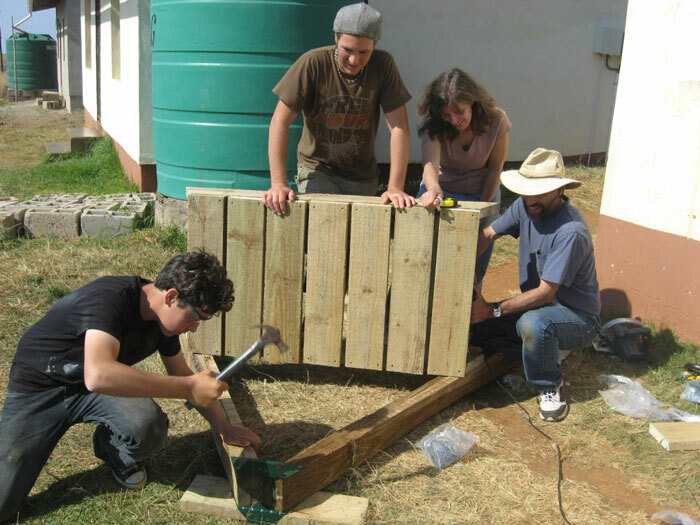 The parents also decided to organise another excursion and a fundraising party later in the year and committed to helping support the school by collecting water and helping at working bees. 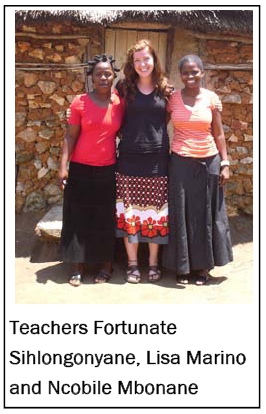 Most exciting of all, of course, are the 22 little people who have enrolled to study at Matjana in 2009. They came in an array of exotic fashion, some in already school uniforms, other wearing their Sunday best because they had not yet had a chance to purchase a uniform. And while Ncobile’s adamant that they will all be wearing matching uniforms by the time she takes them on an excursion (in previous years there has been quite and odd collection of styles and patterns, which apparently caused our teachers some embarrassment when they took the kids into town) she welcomed each and every one warmly, and only managed to make a few cry by questioning them a little too intently. But we’ve learnt to expect a few tears on the first day and for the most part we’ve learnt to back off when kids make that “I’m about to cry” face. But the first day went smoothly. The kids all offered their names (which is a big improvement on our first year, when it was well into the second day before we could get all the kids to reply to our simple questions). They quickly began running around and enjoying the balls. 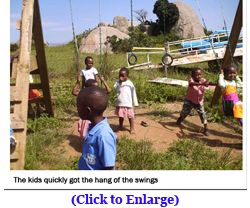 They approached the swings a bit cautiously at first, but it wasn’t long before kids were swooshing through the air, peering down off the climbing frame and taking turns to push each other. As usual, they expressed their personalities almost immediately. Some hung around the edges, waiting nervously for a turn, while others marched straight up to the swing . 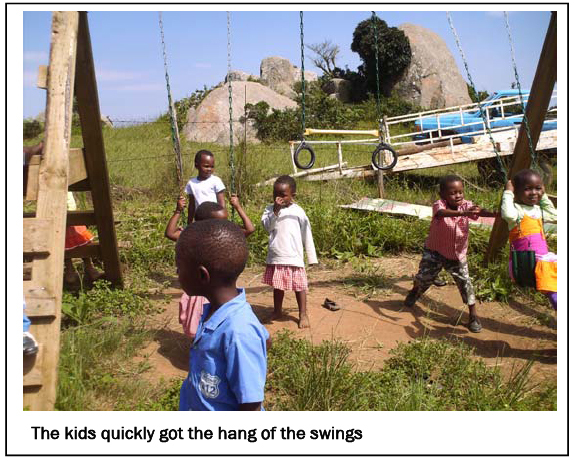 Others bossed their new school mates around, telling them such things as where to wait in line, who was next and when to get on and off the swing. Its wonderful to see the school so full of life again, to hear the shrieks of excitement and strange observations of a bunch of little people experiencing their first day at school. It was just as great to see many big improvements have happened at the school, since we opened this time a year ago and think about what might be possible this year.